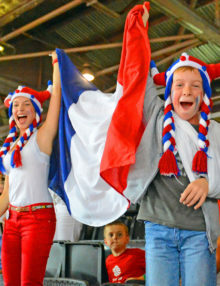 Avid fans, Lora and David Burgun, from Strasburg France, celebrate Lucie Decosse’s gold medal victory in the women’s Judo Finals in the London Olympics. Lucie Decosse (white) from France throws Thiele Kerstin (Blue) from Germany in the women’s final judo competition in the London Olympics. 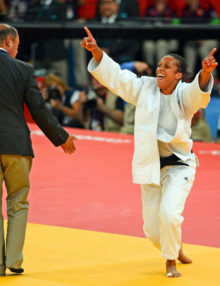 Lucie Decosse won the gold medal. Lucie Decosse(white)from France throws Thiele Kerstin(Blue)from Germany in the women’s final judo competition in the London Olympics. Lucie Decosse won the gold medal. Asley Gonzalez(white) from Cuba expresses shock after being thrown by Song Dae-Nam(Blue)from Korea. Song won the gold medal in the men’s judo finals.